Try and watch a few clays to see how they’re being presented before it’s your turn to shoot. This will enable you to decide where your preferred kill zone will be, and this in turn dictates your foot position and stance. As with most targets, when you get onto the stand and it’s your turn to shoot, position yourself so that your weight is on your front foot, with your toes pointing directly towards the intended killing position. This will ensure you won’t restrict your gun movement and are able to keep the muzzles swinging freely throughout the course of the shot. Holding the muzzles too high when you shout ‘pull’ can be a real handicap as the barrels can sometimes actually hide the clay from view when it leaves the trap. This can result in you having to chop down on the clay at the last moment, which interrupts a steady, smooth swing. By holding the muzzles lower you get to watch the target from the outset, enabling you to react immediately if it bounces. 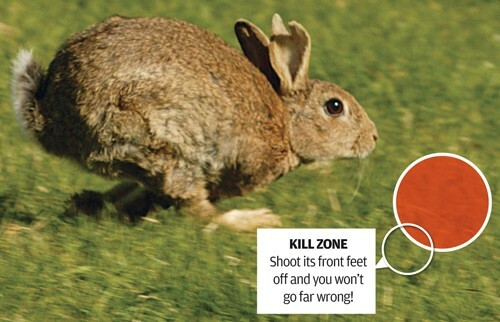 Knowing where you want to kill the target can help eliminate one of the most common mistakes when shooting bolting rabbits – trying to shoot it too soon after it leaves the trap. Position yourself with the muzzles pointing too near the trap and you’ll invariably find that the clay shoots past you before you’re ready, forcing you to chase after it with the barrels. Because of your incorrect position, you’ll run out of swing and the muzzles come off the line of the target. And you’ll probably miss. Address the kill point correctly, then turn from the waist to find the pick up point. Don’t let the target get so far in front that you’re chasing it.